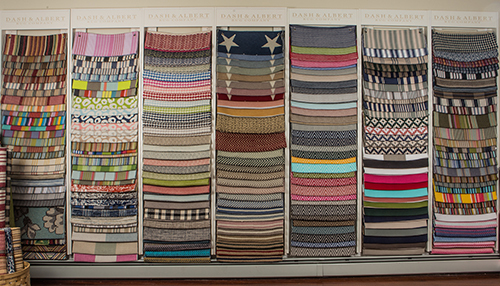 Proudly located in New England, Dash & Albert has a vast selection of wool, cotton, jute, sisal, and indoor/outdoor rugs. Dove & Distaff has one of the largest displays in the area. You will see that these rugs will easily transform your house, whether it is formal or casual or beach cottage, into your HOME. Company C has added in-depth textural features to many of their current designs. 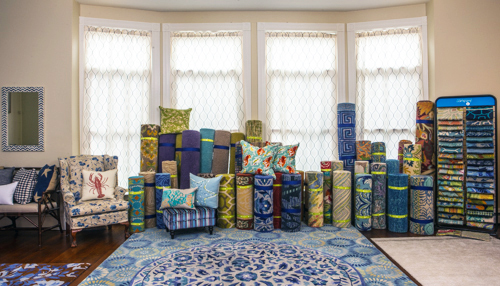 This New England company is well known for their reputation for quality, color and artistic styling. Style underfoot and a treat for your feet. 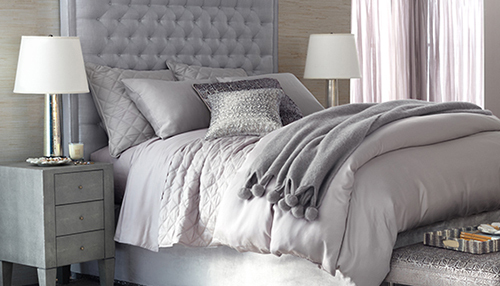 Designers Guild has an approach to design that begs your attention. Their use of mixed and blended fibers add new dimension to their rugs. Whether 100% New Zealand Wool or mixtures of Bamboo, Viscose, Cotton, and Rayon, this line offers some of the softest and most eye-catching rugs available. Pine Cone Hill, Company C and Taylor Linens... all purveyors of fine quality linens... can supply your bedding needs from sheets to blankets to quilts and duvet covers to bed pillows, duvet inserts and matelasses. From the sweetest embroidered "Sweet Dreams" pillowcases to the rise and shine "Good Morning" pillowcases, you will be delighted with these selections. 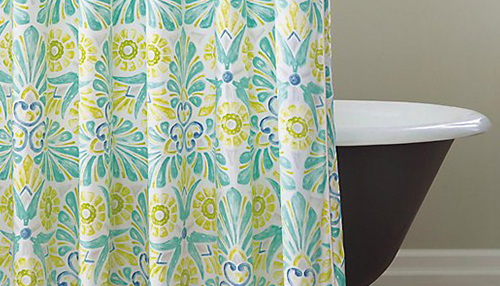 Step out from behind that new shower curtain onto that new bath rug and grab that soft, absorbent new towel. We can add a touch of sunshine to your morning routine with an array of new bath linens from Pine Cone Hill, Company C and Designers Guild. Come see the difference that fine quality can make. Table linens add to the dining experience. Slow down - enjoy your meal with family and friends surrounded by beauty. Whether the night calls for the formal touch of Beauville's hand silk screened tablecloths, placemats, runners and napkins, or the more casual designs of Pine Cone Hill, CLM, Company C and Designers Guild. Pillows can be an easy way to decorate, re-decorate, or simply change the mood of a room. 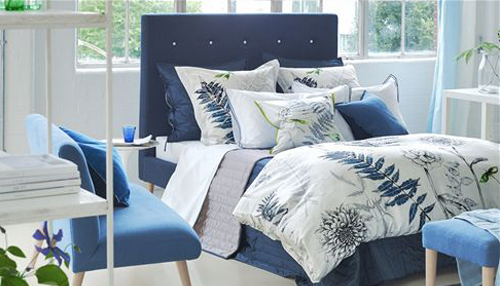 Designers Guild gives you additional options by offering two-sided pillows…flip front to back for two very different looks. Company C pillows offer texture & whimsy. Beauville hand silk-screened pillows will delight in the depth of their design. We also carry Ox Bow Decor, The White Starfish, Peking Handicraft and Designs of Distinction. 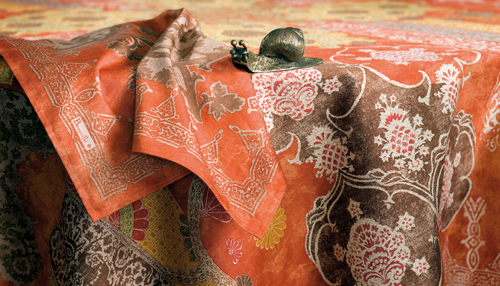 A soft and beautiful throw can ward off the chill of a Summer’s breeze, or wrap you comfort when the Winter winds blow. At Dove & Distaff you can choose how you would like to snuggle with lambswool & linen, wool, alpaca, fleece, cotton or chenille. 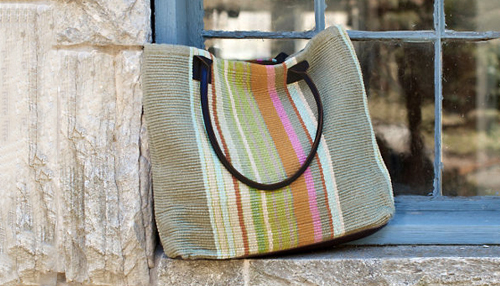 When you need a tote bag, you want a roomy and strong bag that is as practical at the beach as at the grocery store. Dash & Albert and See Design totes give you all that along with the style, color and design you were looking for. These bags are both useful and fun. Here we go! Time to batten down the hatches and get ready to settle in. 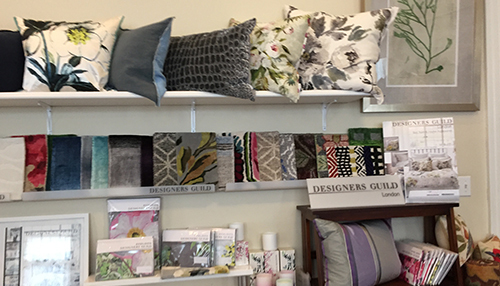 Hi, I’m Carla Davis, owner of the Dove and Distaff Rug Gallery in Wakefield, and we are bursting with items that will bring warmth, cheer and comfort to your home. To welcome you back indoors, we are offering all in-stock wool rugs at 30% off- a big discount on some absolutely gorgeous rugs from Company C and Dash and Albert. November also brings a great deal on pillows- buy one, get the second at 50% off. Bring a spot of color to your rooms with some beautiful throw pillows! We have lots of new stock arriving for the holidays; seasonal doormats, pajamas, robes and table linens- it’s never too early to be ready for guests – or to get a head start on your holiday shopping! Maybe your bed needs something new to wear?Come see what’s in store for you at the Dove and Distaff Rug Gallery at 365 Main St. in Wakefield. 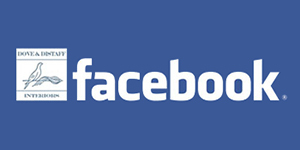 We are open from 10-4, Monday through Saturday. Local Shopping at Dove and Distaff Rug Gallery.